Call To Speak With a Live Person & Not a Machine! Are you tired of laying out tarps just right only to have them shift before you get a chance to tape them down? What about spending hours cleaning up the jobsite? When you turn to the professionals at Couser Supply, Inc., you can find a better way to keep the area you're working on safer and cleaner. As a national company, we have provided quality construction floor protection solutions to countless clients. Our products are durable, yet thin enough to be carried from one job to the next easily. Most of our jobsite floor protection products come in a large roll of self-adhering film. Simply start at one end of the room and roll it out to protect floors from dirt, dust, grime, scuffs, and damage. Because of our products' low-tack adhesive backing, they stick to the floor and other material without having to use tape, allowing you to feel confident in the full coverage it provides. Furthermore, because they don't slip and slide around, you are safer on the job. The low-tack adhesive doesn't create a lasting bond with the flooring, which means you can simply peel it up without leaving extra sticky residue. With our construction protection products, cleanup can be done in minutes, not hours. Are you unsure about the type of floor protection solutions that would serve your needs most effectively? Then ask our professionals. We are happy to discuss your goals and your normal business operations to find the products that fit your needs and your budget. Two of our most popular construction floor protection options are our carpet protection film and our Zip-Up temporary film. Both of these come in different sizes, with some options having the adhesive on the outer side for faster application. Our tear-and puncture-resistant products let you know your clients' floors are safe throughout the entire project. Whether you are working on a single room or an entire office building, count on our jobsite floor protection company for products that fit your needs. 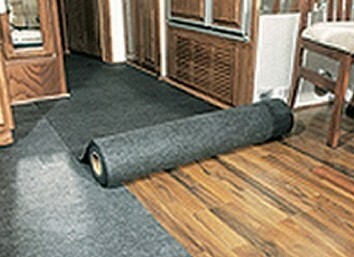 We not only offer solutions for carpet protection, but also for wood, laminate, vinyl, and other hard-surfaced flooring. There are also different roll sizes to choose from, which means you won't have to waste money on extra materials or fear that you don't have enough for your project. Contact us today to learn more about our construction floor protection products. We are proud to offer floor protection solutions to customers across the country.